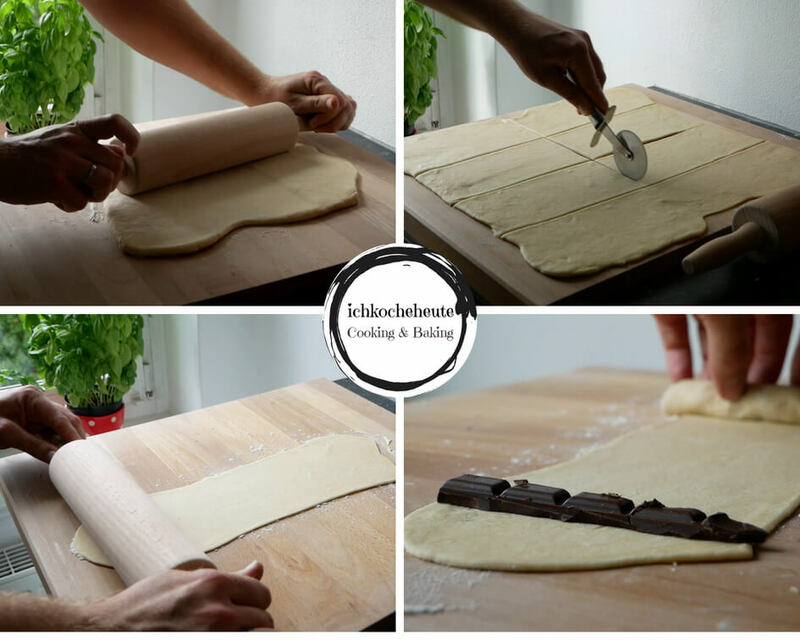 In today’s post, I’ll show you a simple recipe for delicious chocolate rolls. 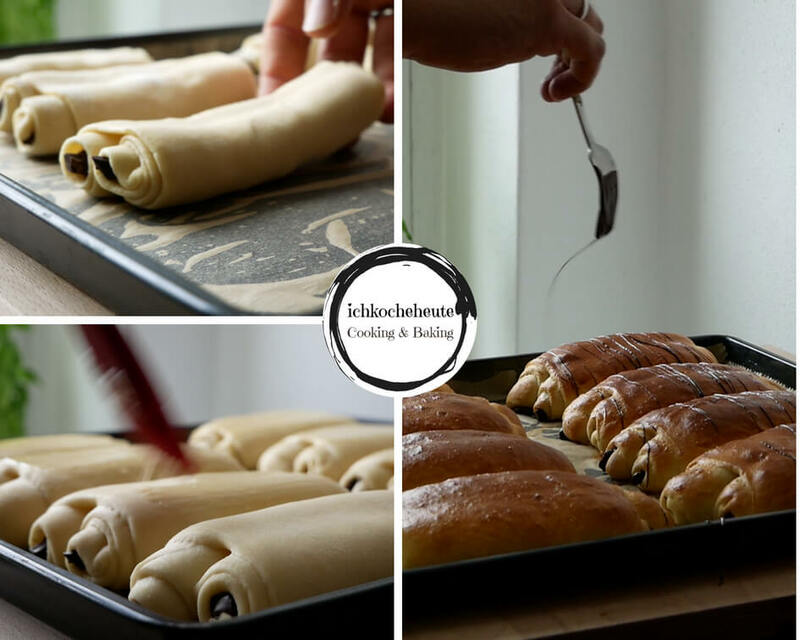 The rolls are made from a sweet yeast dough & rolled up like a “Pain Au Chocolat”, a French pastry made from brioche dough or puff pastry with chocolate filling. Alternatively, the rolls can also be baked with chocolate drops or raisins & in an angular or round shape. Have fun baking! Crumble 20 grams fresh yeast into a high container, add 50 grams sugar, 1 sachet vanilla sugar & 250 milliliters lukewarm milk & stir together with a whisk or fork until yeast & sugar have completely dissolved. 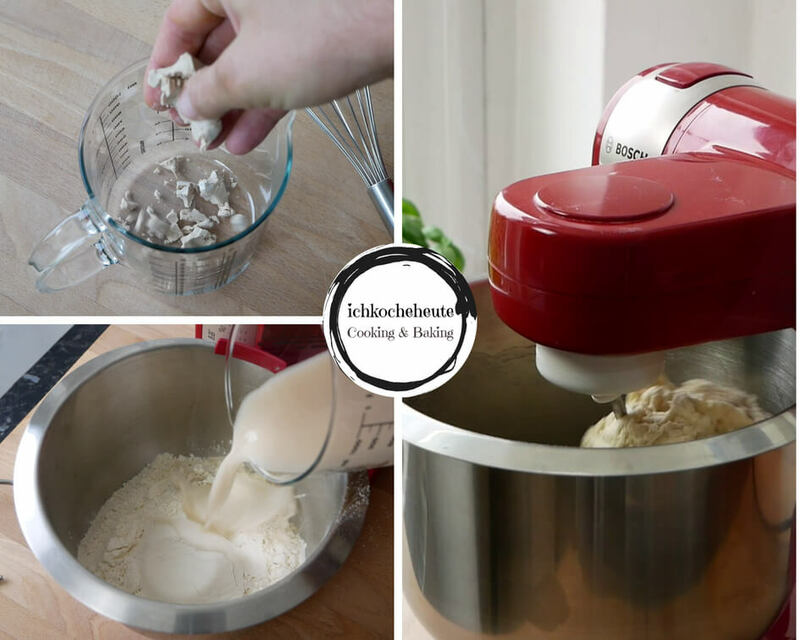 Next, in a mixing bowl combine yeast-water mixture along with 500 grams flour, 50 grams soft butter, 1 egg & a teaspoon salt & knead with a kitchen machine or mixer with dough hook for about 4 – 5 minutes until a sticky dough. Then give the dough a ball shape with your hands onto a slightly floured worktop & roll out with a rolling pin to a rectangle about 50cm x 40cm. Cut the dough sheet into 8 equal-sized rectangular pieces and roll out each piece of dough on a lightly floured work surface from the inside out to an elongated & thin strip of dough. 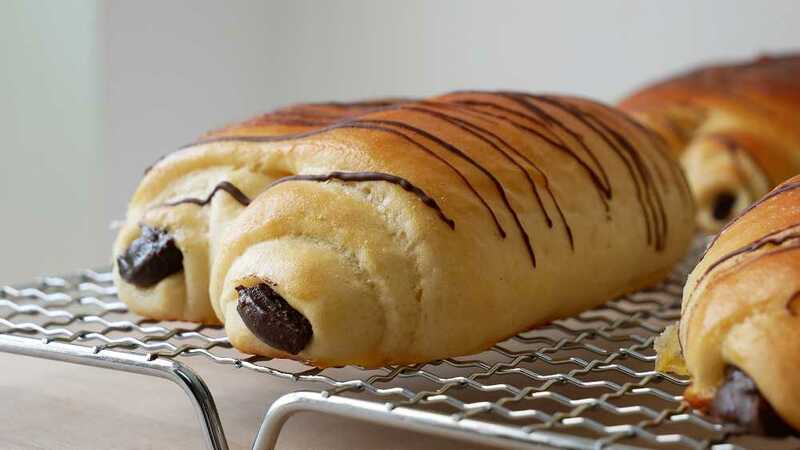 Garnish each end of the dough strip with a bar of dark chocolate & roll up the chocolate rolls towards the middle, then place the chocolate rolls on a lined baking tray & allow to rest for 45 – 60 minutes covered with a kitchen towel in a warm place. Preheat the oven to 200°C (top/bottom heat) in good time. Next whisk up 1 egg in a small bowl, brush the risen chocolate rolls with the whisked egg mixture & then bake for about 12 – 15 minutes in the preheated oven until golden brown. Get the done chocolate rolls out of the oven, possibly sprinkle a bit melted dark chocolate decoratively onto the rolls & then allow them to cool on a wire rack. Best served warm, so the chocolate is still warm and liquid inside. I wish you lots of fun baking!